We often look to the East for answers to our spiritual and health needs, and many of us seek out European and North American beauty experts, treatments, and products. Now, for the first time, enjoy the best from both East and West: experience your own natural beauty from the inside out with Healthy Beauty. Based on Letha Hadady' s worldwide search and drawing on and celebrating our rich ethnic and cultural diversity, Healthy Beauty incorporates Asian and Western therapies as well as the world-class wisdom of renowned beauty authorities, ranging from nineteenth-century femme fatale Countess Lola Montez to today' s top celebrity stylists and style gurus. In Healthy Beauty, Hadady helps you create your individual beauty persona. She recommends and gives guidelines for using readily available herbs, diets, homeopathic remedies, stress-reduction techniques, and cruelty-free beauty and health products suitable for both women and men who have any beauty issue such as being overweight, a troubled or aging complexion, hair loss, or prematurely gray hair. 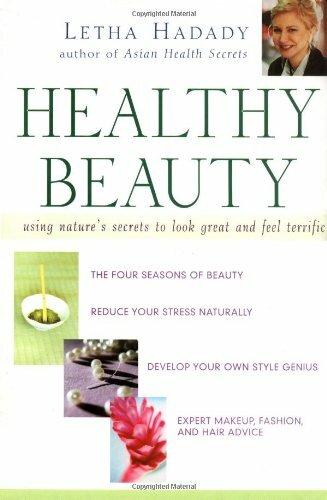 Healthy Beauty will show you how to combine diet and beauty products suited to your particular skin and hair needs, achieve a pleasing voice and personal fragrance, brighten your eyes and eliminate fatigue, improve your posture and reduce backache naturally, and dress and make yourself up for work or dating. Healthy Beauty includes an annotated resource guide featuring a wide variety of mail order and Internet companies to help you locate natural health and beauty products. Reclaim your beauty and personal power the way nature intended with Healthy Beauty.
" The first book of its kind . . . an international beauty recipe of tried-and-true home preparations blended with the most modern, technologically advanced products on the market today . . . truly a celebration of beauty in all its diversity. " 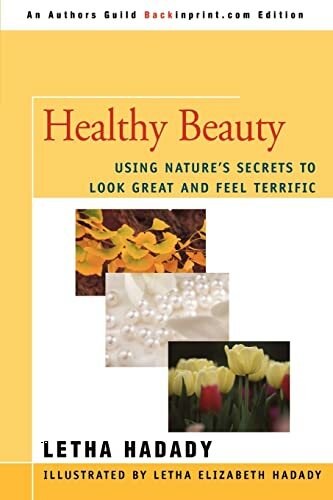 - From the Foreword by Clif deRaita, National Director of Makeup at Georgette Klinger, Inc.
" I very much enjoyed reading Healthy Beauty and I learned a great deal. The timely information and spiritual aspects of the book will be appreciated now more than ever. " " This book is touched by genius. Letha Hadady has a great sense of beauty in everything she does. " " Healthy Beauty is fabulous! A must for anyone interested in beauty." " There is a radiance that glows from within: it is the radiance of intent, passion, wholeness, and harmony with life. Letha Hadady lights the spark of that radiance with her book. In Healthy Beauty, we can be confident of finding beauty elixirs to create not only the face we present to the world, but the peace of mind we need in the quiet of our lives."